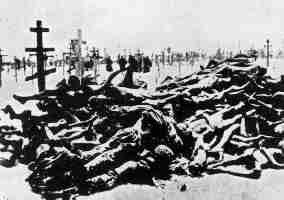 Between 1932 and 1933 the Soviet regime programmed the extermination of Ukraine through a programmed and artificially made famine. The granary of Europe was transformed into a desert steppe where the survivors did not have the force to bury the dead. "In the former Soviet Union millions of men, women and children fell victims to the cruel actions and policies of the totalitarian regime. The Great Famine of 1932-33 in Ukraine (Holodomor), which took 7 to 10 millions of innocent lives, became a national tragedy for the Ukrainian people. In this regard we note activities in observance of the 70th anniversary. "Honoring the 70th anniversary of the Ukrainian tragedy, we also commemorate the memory of millions of Russians, Kazakhs, and representatives of other nationalities who died of starvation in the Volga river region, North Caucasus, Kazakhstan and in other parts of the former Soviet Union, as a result of Civil war and forced collectivization, leaving deep scars in the consciousness of future generations. "Expressing sympathy to the victims of the Great Famine, we call upon all Member States, the United Nations and its special agencies, international and regional organizations, as well as non- governmental organizations, foundations and associations to pay tribute to the memory of those who perished during that tragic period of history. "Recognizing the importance of raising public awareness on the tragic events in the history of mankind for the prevention in the future, we deplore the acts and policies, which brought about mass starvation and the deaths of millions of people. We do not want to settle scores with the past, it could not be changed, but we are convinced that exposing violations of human rights, preserving historical records and restoring the dignity of victims through acknowledgement of their suffering, will guide future societies and help to avoid similar catastrophes in the future. We need as many people as possible to learn about this tragedy and consider that this knowledge will strengthen the effectiveness of the rule of law and enhance respect for human rights and fundamental freedoms." ஒருநாளும் கம்யூனிஸத்துக்கு ஆதரவாகவோ, கம்யூனிஸ்டுகளுக்கு ஆதரவாகவோ இருக்கமாட்டோம் என்று உறுதி பூணுவோம். இது போன்று அடிக்கடி கம்யூனிஸ அட்டூழியங்களை ஆவணப்படுத்துங்கள்.